Thai filmmaker Nawapol Thamrongrattanarit wasn't sure whether to believe it when he was offered unfettered, behind-the-scenes access into the normally closely guarded and secretive world of one of Asia's biggest pop idol bands. Turns out the director got closer than he could have ever dreamed. "There were no restrictions placed on me," said Nawapol, whose quirky arthouse films chronicling youth in the digital age have made him one of Thailand's most beloved auteurs. "I just sat the band members down in front of the camera and we started to talk. For them it was like confessions, like therapy." The result is the engaging documentary BNK48: Girls Don't Cry, which frames the rise of a Thai pop sensation from complete unknowns to having hundreds of millions of fans. Previous documentaries on Asia's pop idols have been carefully controlled by band management. Not so this time, as the film presents the young hopefuls of BNK48 and their real stories, rather than those dreamed up by a press office. One member auditions for the band simply because it was her mother's wish, another because a fortune teller told her she would one day be a star and a third because she had grown up fearing a life of anonymity. "Always being a no one would be frightening," says 19-year-old Korn. Nawapol picked up on the story of the band last year and sat several of its members down for emotionally charged reflections on their careers and their arduous training regimen, which include nine-hour daily workouts. 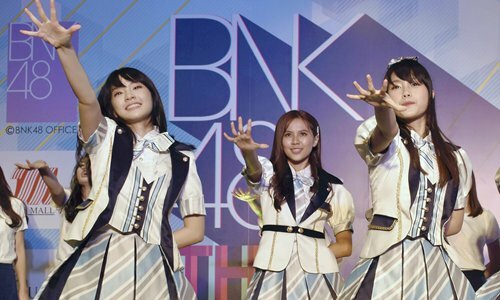 A brutal selection process eventually trims a 30-girl squad down to 16 - a concept popularized by Japanese girl group megastars AKB48, from whom the Thai band is franchised. Those who make the cut are featured in the band's singles and video clips, with more opportunities to face the public. The others - known as "Unders" - must wait in the shadows as the spotlight shines on their friends, a process that seems to have a devastating emotional effect on some, while revealing a steely resolve in others. One of the most poignant scenes features the main band members up on stage, while a single figure dances alone off-stage, pretending she is part of the main event. "You have to face life's reality," says the 14-year-old Jib, who by the film's end has begun speaking more like a 40-year-old. Auditions for the band were opened to girls aged 12-22, and there is a remarkable change of appearance and attitude in them all over the 12 months. What surprised Nawapol most once he started filming was how the usually carefully stage-managed entertainers were willing to open up to his cameras, and how quickly they had changed as human beings. "Usually these pop idols are carefully trained and what they say to the media never really means much," said Nawapol. "But they immediately started talking to us about the realities, the hardships, and all the pressure that they are under." Social media appears the chief culprit there, as selection for the shortlist is based largely on how many followers the ladies have, and how many "likes" they can gather. "It's a feeling like you are being chased all the time," 17-year-old Pun explains of the stress of having to constantly improve her numbers. The film made its international premiere at the ongoing 23rd Busan International Film Festival (BIFF) after a successful run in Thai cinemas that saw it collect around $300,000 at the box office, making the film among the country's most successful ever documentaries. BIFF is scheduled to come to an end on Saturday.